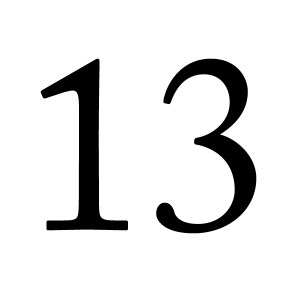 Some of you may know that triskaidekaphobia (pronounced triss – kai – deck – a – foh – bee – uh) is not only the fear of the number 13, but also a great word to trot out when trying to impress, or perhaps just appear to be a random geek. Gamblers may avoid betting on the number, while some other worriers will avoid all sorts of travel on the 13th day of the month, especially if it falls on a Friday. As is often the way, worldwide cultural differences mean that the fear of the number 13 is particular to the west, whereas in Asia a fear of the number 4 is more the norm. UK lottery operator Camelot is unusual in that it operates a UK only raffle as an ‘add on’ to each twice-weekly Euromillions draw, perhaps in part to mop up the surplus cash created by the exchange rate differential between the UK price of £2 sterling for a ticket as opposed to the lesser value of €2 charged in Europe. It turns out that you don’t choose the raffle number, the lottery chooses it for you, and automatically allocates it to your ticket. All this may help formulating strategies to maximise a win on the main draw itself, where you have the power to choose your own numbers or to leave it to the chance known as a ‘lucky dip.’ Since you can’t accurately predict the numbers to ensure a win, perhaps the next best thing is to avoid the numbers that most other people pick, in order to ensure that you share any win with as few people as possible. Thus, in the UK, “lucky 7” might be worth avoiding, and “unlucky 13” to be worth considering, to compensate for the fact that fewer than most may have chosen it. Of course, the number 13 has as much or as little chance of any other number as coming up, but if it does, along with your other selected numbers, you may be lucky and win a bigger prize as a result. Then your only problem to overcome is the fear of losing your money in the first place, and with odds of 1 in almost 117 million of hitting the Euromillions jackpot, that’s a very understandable fear. It’s called Antichrometophobia. I have always been afraid of Friday the 13th, ever since I set my cat on fire, after tripping on a rug and knocking an old oil lamp all over poor Tom. So I will not be following your advice, however great article, and I love Interesting Everything.